Operating out of a very, very modest storefront near the corner of Holly and Comals Sts. 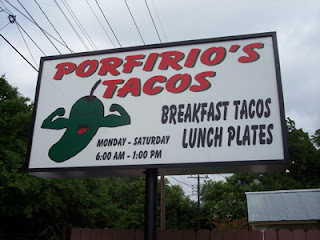 just east of downtown Austin, Porfirio's offers breakfast tacos and lunch plates from 6am to 1pm monday through saturday. I guess if you looked at the picture, you already knew that. 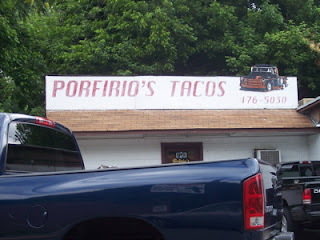 I missed the Porfirio's truck after I moved on to non-downtown job opportunities, so I was quite chuffed when I recently drove by their practically hidden store front on the east side. I especially dig the carne guisada tacos, and they'll make them south tx. style with refried beans and cheese by request. If you haven't had a carne guisada, beans and cheese taco, you are seriously missing out. Porfirio's is absolutely the place in town to try this taco combo for yourself. All of the standard breakfast tacos are excellent as well, with the potatoes being especially great. The crispy beef tacos are also super ridiculously tasty if you happen to make it down there for lunch before they close at 1pm. Part of what makes the various tacos at Porfirio's so good is the homemade salsa. It's a very spicy green salsa, that has a distinct and lovely flavor. It's not the tomatillo based green salsa you find at most places, and I suspect it's made mostly of blended jalapenos. Unmissable. I've been eating at Porfiro's for over 15 years. Consistent, good quality food. I have friends from San Jose who still talk about. It is an Austin Icon. The egg, potato, and bacon taco is my favorite. Packed with big chunks of bacon and then top it with that great salsa; my mouth is watering just thinking about it. And you can pay for it with pocket change. No frills, just great food. I recently moved to Austin (Summer '08) and discovered their truck one morning. I tried various breakfast tacos and am now stuck on the Chorizo & Egg. The green sauce is excellent as well! I stop by Porfirio's on Holly many, many mornings. I get a potato bacon & egg taco for breakfast and an egg & chorizo taco to eat later for lunch. Is so good! and they are so nice! Porfirio's used to deliver to my office and it was great. I stop a their various trucks whenever I can. Try the bean & bacon. They are almost always out of it.